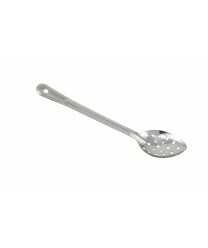 The Winco BSPT-13 Perforated Basting Spoon with Stainless Steel Handle, 13" features a simple but classic design. Made of durable, rust-resistant material, this perforated cooking spoon is great for mixing, stirring and transferring food from pan to platter. The long, slim handle is easy-to-grip and distances your hand from the heat of the oven or stove. A handy hang hole allow for convenient storage.